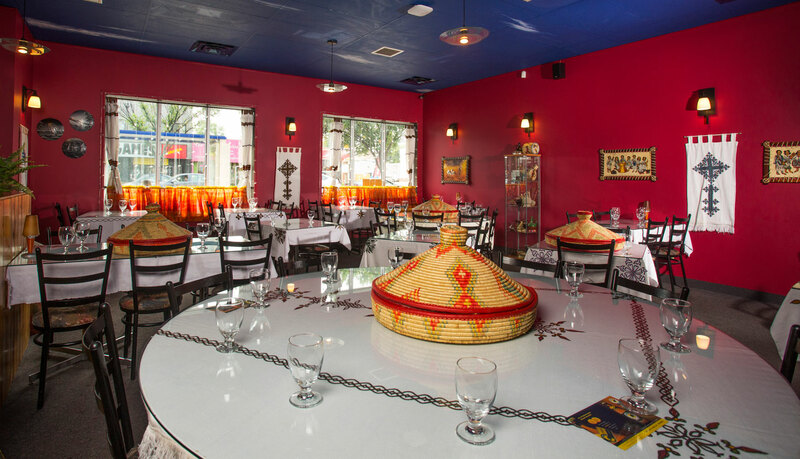 Langano Skies Ethiopian Restaurant is named after Lake Langano, a popular hot spot in Ethiopia’s Great Rift Valley. 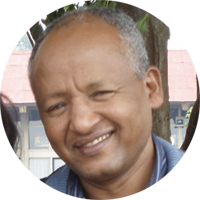 With its waters set of the Arsi Mountains, Langano is a paradise for boating and swimming. People who travel here cannot help but enjoy themselves. We hope your experience at Langano Skies is the same. 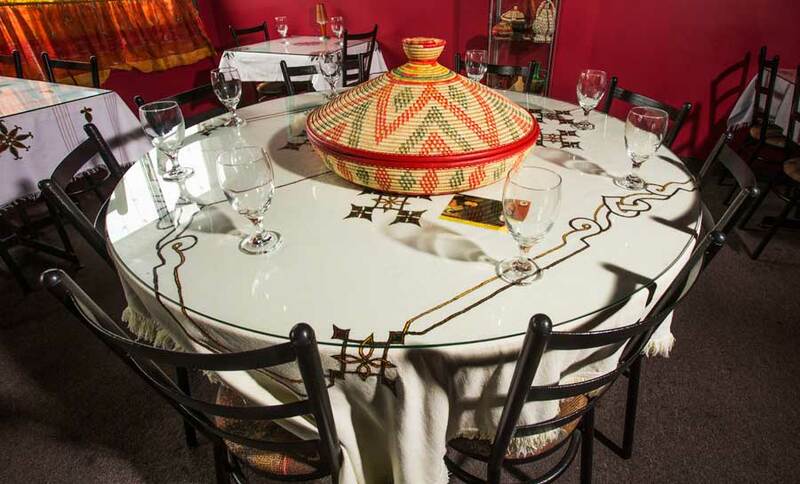 We have created an elegant yet relaxing enviroment for your dining pleasure. 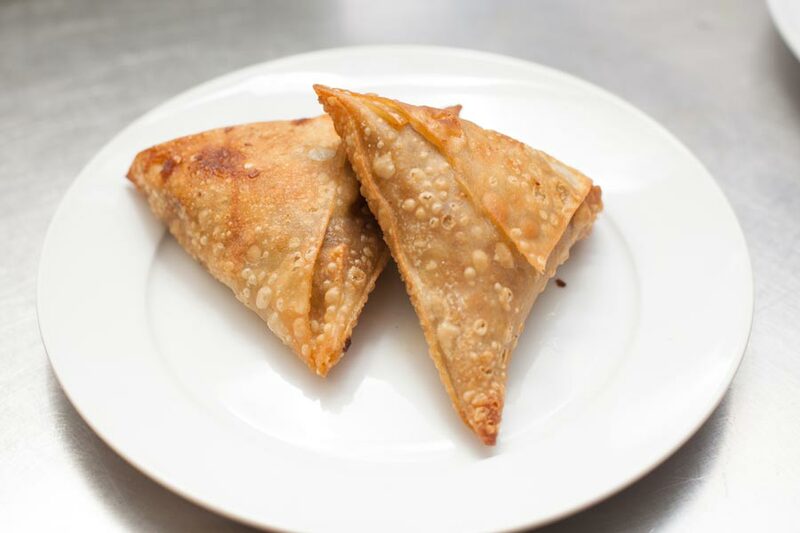 Our goal is to provide you with fresh and delicious food, with fast and friendly service. 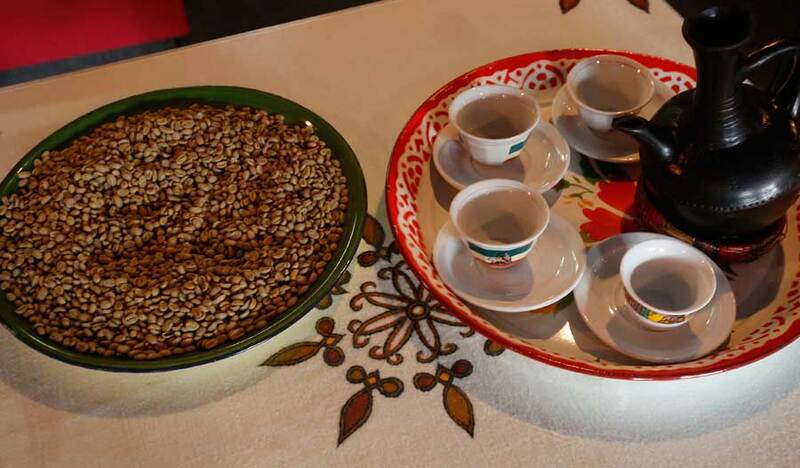 Our hope is that when you leave, you are informed about some of our traditions and are satisfied with a wonderful meal. Spread the word of the Langano Skies experience. 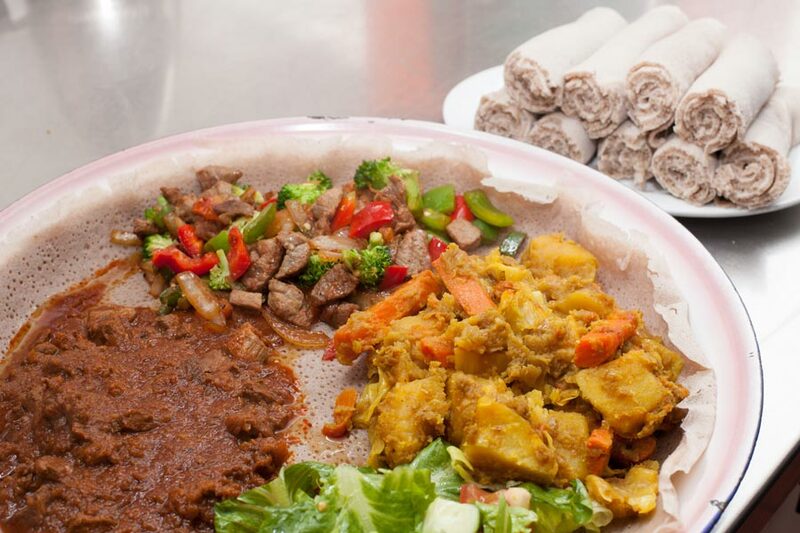 Ethiopian food has essentially remained uninfluenced by other countries and therefore retains its unique taste, style and tradition. 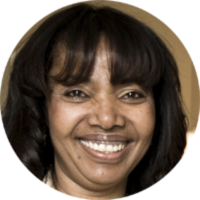 Ethiopians love to share what they have with friends and family. Rich or poor, everyone offers food and drink to every one of their visitors. Ground beef and onions stuffed in a delicious pastry shell. 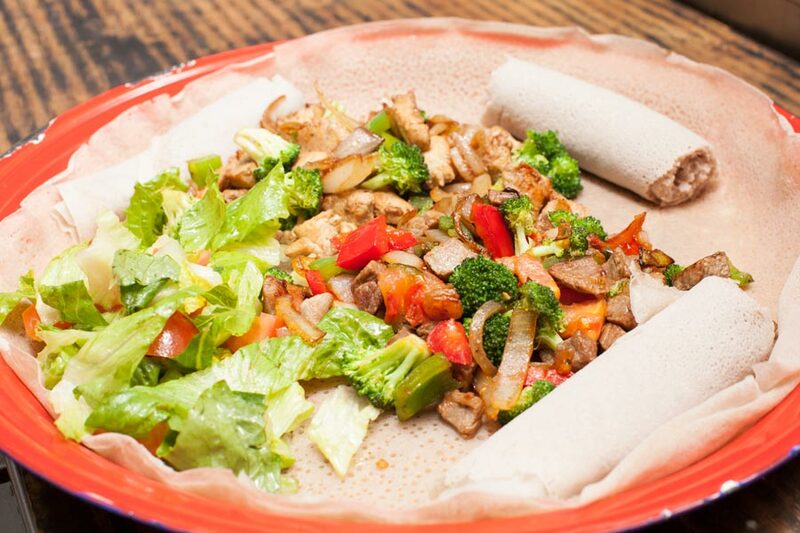 Fresh hot Injera coated with a delectable spread made from jalepeno peppers, garlic, ginger and spiced butter. Green peas, onions, chopped carrots and potatoes stuffed in a delicious pastry shell. Ethiopian style scrambled eggs prepared with jalepeno peppers, onions and tomatoes. Served with Injera. Tasty spiced lentils stuffed in a pastry shell. Mashed fava beans stir fried and sprinkled with fresh tomatoes, jalepeno peppers and feta cheese. Served with pita bread. Fresh romaine lettuce tossed with tomatoes, cucumbers, dried cranberries, almonds, marinated chicken, and our house dressing. 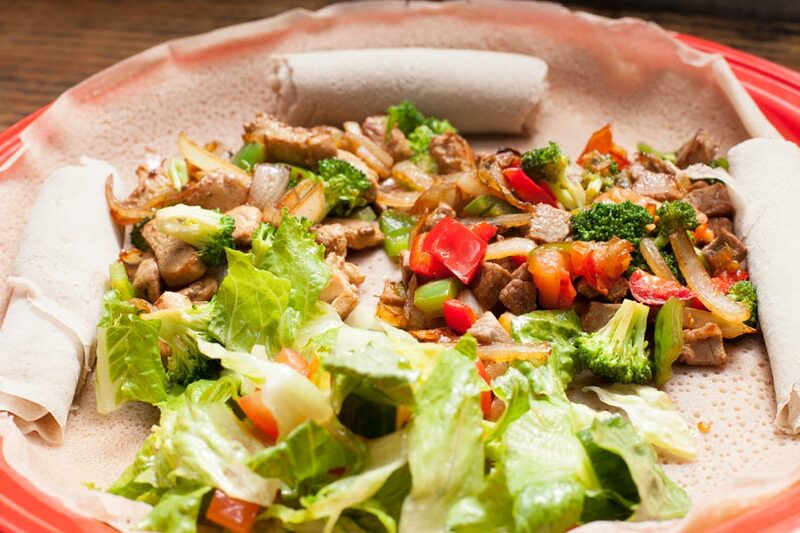 A toasted teff flour medley, diced and mixed with Nitr Kibeh and a rich blend of spices. Celiac-Friendly. Lettuce, tomato, grated carrots and cucumber. Choose between Caesar and our house dressing. Lean beef cubes cooked with onions, Berbere and a blend of spices. Two chicken drumsticks cooked with onions, garlic, fresh ginger and Berbere. Chicken Breast can be substituted. Finely diced extra lean beef seasoned with Mitmita, Nitir Kibeh and served with Iyeb (homemade Ethiopian style cooked cottage cheese). Order it lightly cooked, or raw like steak tartar. Marinated chicken breast with onions, broccoli, green peppers, and Nitir Kibeh, seasoned with herbs and spices. Lean beef cubes sautéed with onions, tomatoes, jalepeno peppers, Nitir Kibeh and seasoned with a rich blend of herbs and spices. Curried chicken breast cooked with onions, garlic and fresh ginger. 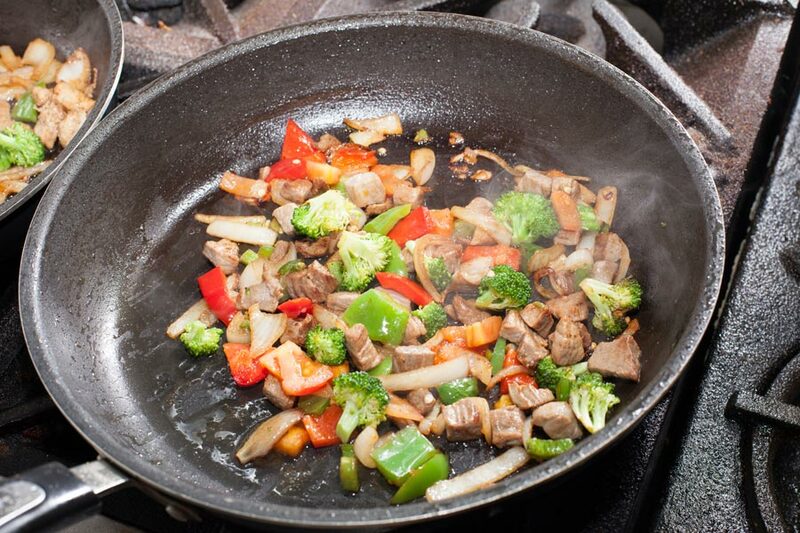 Lean beef cubes sautéed with onions, tomatoes, jalapeno peppers, red and green peppers, broccoli, tomatoes and Nitr Kibeh. Seasoned with a rich blend of herbs and spices. Lamb cooked with Berbere, garlic, onion and fresh ginger. Extra lean beef cubes lightly sautéed with onions, jalepeno peppers and Nitir Kibeh. Served raw like steak tartar. Lamb sautéed with onions, tomatoes, jalepenos and Nitir Kibeh. Seasoned with a rich blend of herbs and spices. Dried beef with tomato base sautéed with onions, Nitir Kibeh, Berbere and mixed with bits of Injera. Curried lamb sauteed with onions, tomatoes, Nitir Kibeh and a rich blend of spices. Split red lentils cooked with onions, fresh garlic, Berbere and a rich blend of spices. 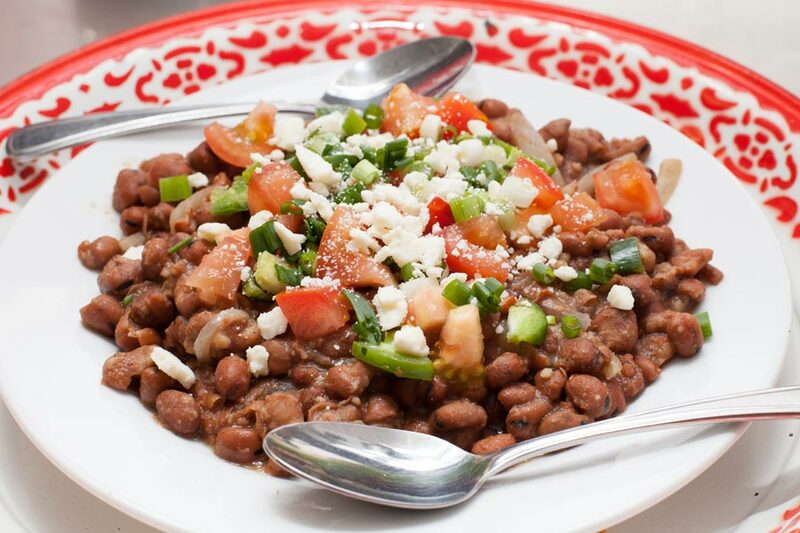 Split peas cooked with onions, fresh garlic, Berbere and a rich blend of spices. Split peas cooked with onions, fresh garlic, curry and blended with a variety of spices. Roasted peas ground and prepared into a sauce mixed with a delicious combination of spices. Chopped spinach cooked to perfection with onions and fresh garlic and served with Iyeb (homemade Ethiopian style cooked cottage cheese). Sliced carrots, potatoes, and cabbage cooked with onions, garlic, and curry. Tomatoes, Red Peppers, broccoli, onions and jalepenos sauteed in a spiced butter. Kitfo, Doro Wot, Gomen Wot and Iyeb (homemade Ethiopian style cooked cottage cheese). Siga Tibs, Doro Wot, Gomen Wot and Ater Kik Aletcha Wot. Served with fresh salad. Gomen Wot, Ater Kik Aletcha Wot, Yemisir Kik Wot and Atekilt Aletcha Wot. Served with fresh salad. 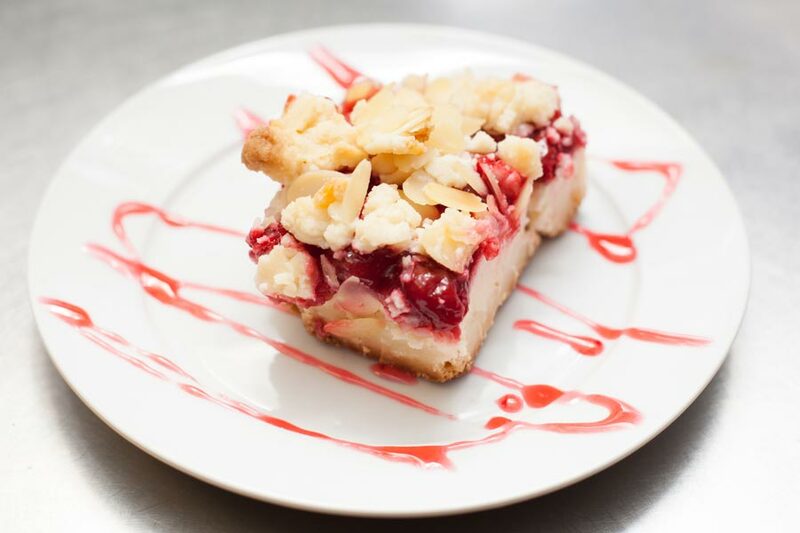 Delectable cherry cheesecake with a crispy crust. Topped with golden crumbs and sliced almonds. Warm, rich chocolate chip brownie topped with vanilla ice cream and chocolate sauce. Sweet oats atop fresh apple slices, baked with cinnamon and brown sugar. Served warm with vanilla ice cream. Vanilla cake topped with delicious coconut and brown sugar. Served with your choice of chocolate, caramel or strawberry sauce. This place is amazing. The food was incredibly good, well-balanced spices and obviously fresh from scratch. We went for lunch on a Saturday and the service was excellent. 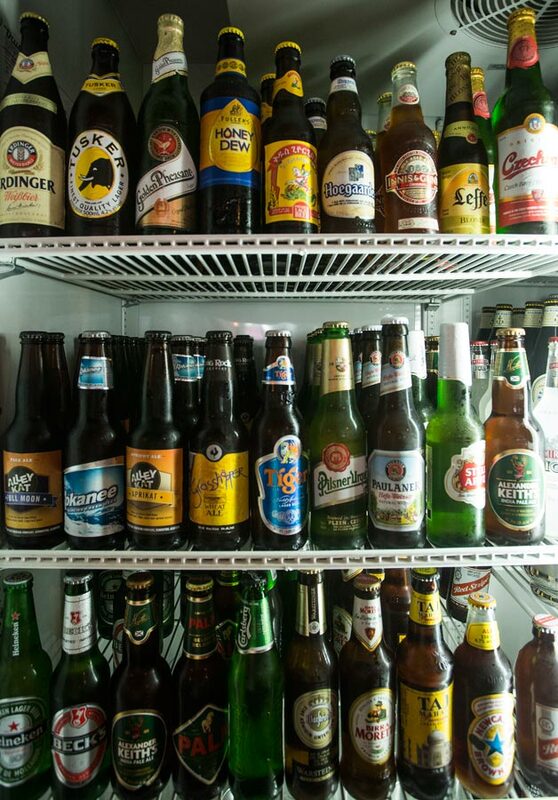 Bonus points for having a really good beer selection. 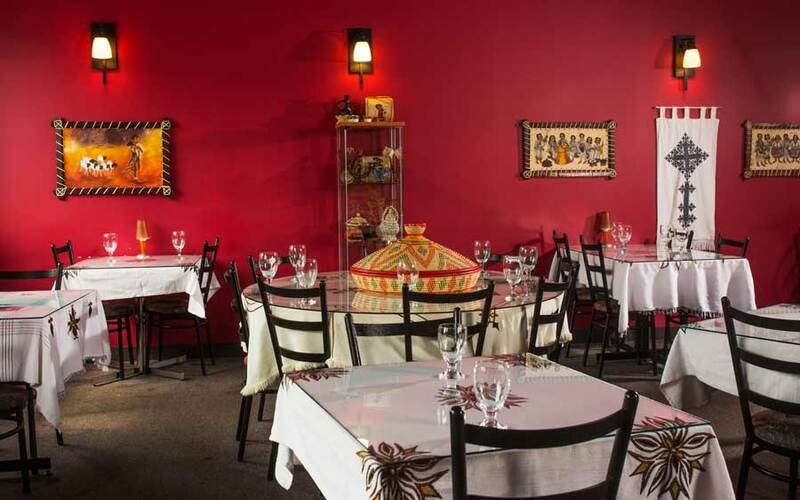 If you are looking for an authentic cultural experience, it is honoured at this restaurant! Delicious food. 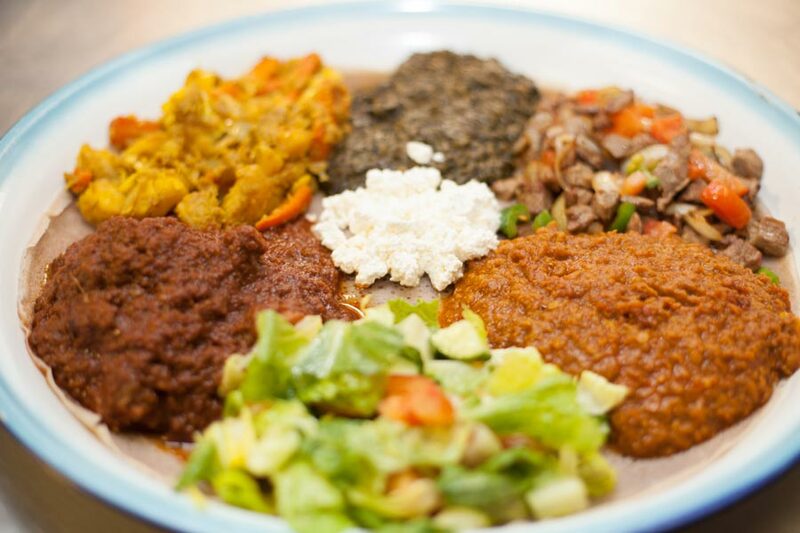 Doro wot with chicken breast was similar to a spicy, thick stew and, served with injera, was a beautiful kick to the senses. Take the plunge! Go a little out of your comfort zone, eat with your hands, connect with your food! This type of cuisine is SO much fun to interact with friends, great conversation. © Copyright Langano Skies 2016 - Site built by Spire Labs.